As you know, my preferred campsite is in the boondocks on public property. My wife and I enjoy the solitude, scenery, and convenience. The price is right, too. 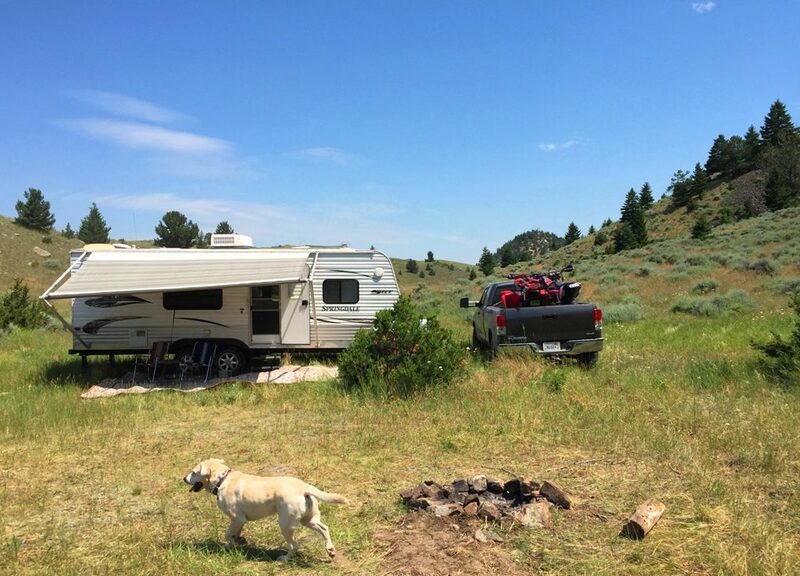 Another advantage of camping in the boondocks is that your dog typically does not need to be leashed, as there are seldom leash laws in the boonies (dispersed camping in national monuments is one of the few exceptions). We recently discovered one more positive feature of boondocking with a dog. We were traveling with our dog-owning friends and were looking for a spot to boondock along a road that bordered fenced National Forest land. So if there is an existing fire ring, you can pretty much be assured that boondocking is okay. Click here to see an example of dispersed camping guidelines. Keep in mind the example is for the Fishlake National Forest, but varies per forest, so always check the guidelines for the area you wish to visit. The unwritten rule for gates on public land in the west (especially where grazing rights are issued) is to leave gates how you found them. If open, leave them opened; if closed, close them behind you. After opening the gate, pulling the trailers through and closing it behind us, we soon had our camp set up. We quickly realized we had our own private dog park, with the closed gate and fence prohibiting our friend’s dog from wandering back onto the nearby road. How sweet is that! 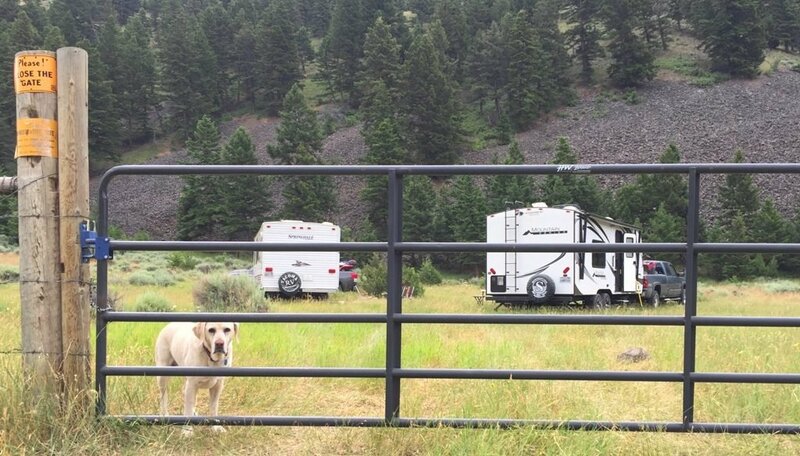 Having a free fenced campsite for the dog—just another adventure in RVing! I’m not sure how big your dog is, but most any dog I have seen could get through that gate if it was chasing a squirrel or something. Maybe a longline and leash would be a better plan. I do enjoy most of your articles. A fence shouldn’t be necessary for a well trained dog who is with with his/her human pack, and this one is only a deterrent to humans in vehicles. If you’re RVing, the 1st thing you want to do is train your dog to stay by you and his trailer/motor home when off leash, (by sitting outside with him a few times a day). When he begins to wander past your decided distance, call him back. Just do it over and over ever day until your dog has it mapped it out. Besides, he loves you sitting out there with him. You want him to know the trailer/moho is his homebase, so even if he does run off, he knows where home is. After a few weeks you should be able to step inside for a few minutes at a time and trust him to stay, then you can gradually lengthen the amount of minutes. Take note, all dogs will have a break point; squirrels, ravens, rabbits, coyotes, these are my dog’s when we are at home. He works extra hard here in this RV Park to ignore these, it’s rather admirable really. It would be equal to me ignoring a frosty mug of Ice Cold Beer, a bag of tortilla chips, and a bowel of guacamole. This may not be doable everywhere, wildlife makes a difference, Fire-Ants, Bears, Rattlesnakes, Skunks, ATVs, Quads, and Dune-Buggies, (humans are often wild). Dogs should be leased regardless while on public land. Otherwise they will be chasing every rabbit and deer in the area, making it that less likely that the next “public” that camps in that spot will see anything. So, Dave, assuming yours is the Private Dog, how did you make it Run? In all seriousness, though, exactly what did you do to MAKE a private dog run? Was it the simple act of closing the gate on the fence that someone else installed ? Wow, Dave, that’s pretty, um, lame. Being on public land it’s not private, and not being on a leash, tether, or any other restraint, the dog can run pretty much anywhere it pleases. Sort of the antithesis of a Private Dog Run that you didn’t make. I’m looking forward to your next entry. I was expecting you to say that you laid a loop of wire on the ground and energized it. At home, my three dogs respect the boundaries of the virtual fence. With a few little white flags, it would not take long for them to learn some new boundaries. Each of them already has a receiver on their collar.. All they would need is few hundred feet of wire and the transmitter borrowed from our house where it isn’t being used anyway when we are on the road. That would be true private dog run. It keeps dogs in (mostly) but doesn’t keep the snakes and coyotes out. Now, where do I find all that public land that you guys are talking about? I live in Virginia.